We combine the work of Fukuoka with Permaculture, Vedic Farming and other non-intrusive techniques of organic farming. Fukuoka visited India many times and found the culture, tradition and nature ideal for his deep understanding of natural farming and natural life. He even called it ‘Gandhi Farming’. We believe that there is a good opportunity for non-intensive farming in the Himalaya after most aggressive techniques and innovations have failed and intensive, monoculture farming is reducing rapidly due to insignificant results. An ever-increasing amount of land is kept uncultivated and due to the shortage of fodder, livestock is reducing rapidly. Though initially appearing detrimental , these are good conditions to allow traditional and natural farming to reintroduce itself. Various practices like non-tilling, clay ball (seed ball) cultivation, mulching, food forests, permanent agriculture, multi cropping, companion planting and more can be implemented. Forest gardens are perfect solutions for the supply of food and fodder to the villagers; indigenous food, culinary and medicinal herbs are a way of growing high value produce for the steadily upcoming health food market. SOS Organics has innovated natural farming together with holistic post-harvesting techniques to enter a very interesting Indian health food market without neglecting the nutritional safety of the village population. We intend to publish the experiences and conclusions in this field online to allow a broad dissemination of natural farming in the hills, which can be naturally adapted for other areas of India and the world. 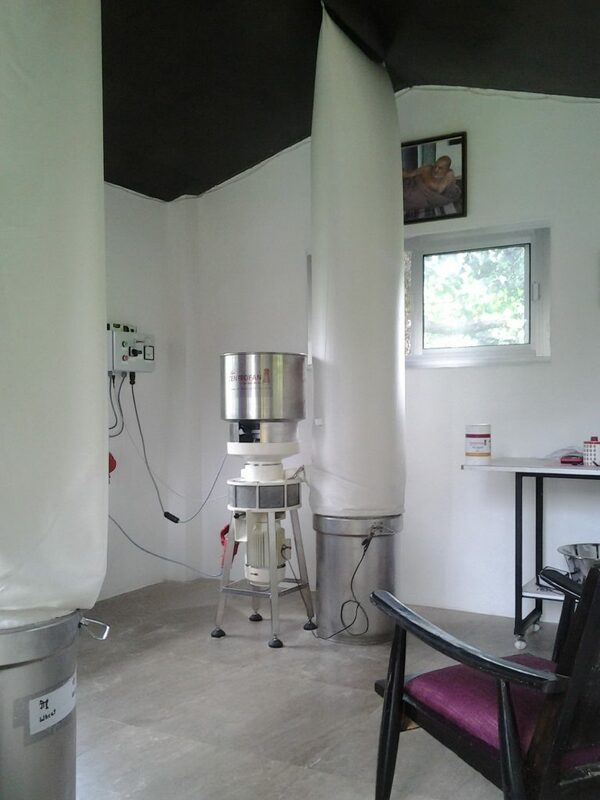 In addition to the farming techniques, natural processing and product development has been undertaken and the Foundation is presently deeply involved in vertical value addition, such as special holistic milling techniques, sun drying and sun-UV-radiation, ventilation drying, dehydrator development for low temperature drying, vacuum packing and systematic moisture proof storing of raw material. An extensive initial product line of natural farming produce has been developed and tested in the market and is now available online and in selected holistic outlets. Among others we are working with 2 Zentrofan mills, which follow the discoveries of Viktor Schauberger, which work on the vortex principle. There are currently only 70 mills being used in the world, two of which are with us here in Uttrakhand. We have developed significant experience with these “wonder mills” as the present engineer in Germany, Mr. Braunwarth, lovingly calls them. The vision is to treat the grains with the same respect during processing, that nature does during the growing process. We also have another application of a three roller de-huller for brown rice and millets. For further information we suggest that you watch the works of Schauberger and Fukuoka which can be found on youtube. There are many important videos documenting this path breaking and work.